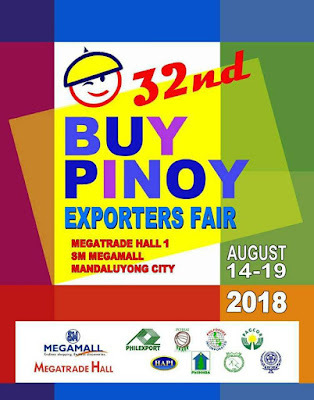 The 32nd BUY PINOY EXPORTERS FAIR happens on August 14-19, 2018 from 10am to 9pm at Bldg. B Megatrade Hall 1, SM Megamall, Mandaluyong City. It features the products of more than a hundred manufacturers/exporters from different regions of the Philippines - 60% of which are exporters and 40% are would-be exporters. For more info, please contact BPEF secretariat, Ms. Michelle Anabe at 0998 965-8094.